I'm not sure if I should be grateful or frustrated that Alessandra is finally catching up on all the sleep she DIDN'T get over the past, I don't know, eight months? I'm grateful for obvious reasons, but frustrated because she always takes the greatest naps during the most inconvenient times. Take this morning, for example. Everyone slept very well last night, and we were actually ready to walk out the door in time for Mass. Except for Little Miss, who was sleeping soundly and would not wake up for anything. So I sent the boys ahead, and stayed behind until Alessandra decided it was time to wake up (naturally, she wanted to have an extra long nursing session), so by the time we finally got to church, it was time for communion. Whoops. Well, at least she was dressed appropriately for the holiday season, right? Off to deal with a Christmas tree disaster. Ever since our very first Christmas together, Will and I have been cursed with tree stands that either a) are flimsy and break the second we place a tree in them, b) work great for one year and inevitably get damaged during one of our many moves, or c) just flat out don't work. For no reason at all. We're currently dealing with problem B and sort-of C. Sigh. 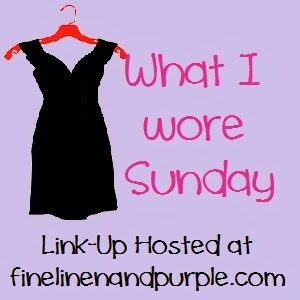 For more What I Wore Sunday, visit the ladies at Fine Linen and Purple!